Some years ago were having a lunchtime beer in the yacht club bar with some pals, having taken a break from working on our boats. One of their recent purchases, they told us, was an EPIRB. I remember we were having to speak very loudly to make ourselves heard over the clatter of a helicopter hovering nearby. We thought nothing of it at the time - after all this was Holes Bay in Poole Harbour, close to the home of the Royal Marines who were frequently charging around in choppers and fast landing craft - so we weren't too surprised by the presence of the helicopter. "What, exactly, was the nature of your distress?" asked the Coastguard Officer. Protestations of innocence fell on deaf ears. The Coastguard Officer firmly but courteously explained that they could find themselves on the wrong end of a large fine - and confiscated their EPIRB to boot! What Is A Marine EPIRB & How Does It Work? The EPIRB system, or Electronic Position Indicating Radio Beacon system to give it its full name, is a sub-system of the Global Maritime Distress and Safety System (GMDSS). These are linked to a specific vessel, allowing rescue agencies to look up its emergency information in a database. When your EPIRB transmits, rescuers know who you are and can phone your emergency contacts to verify your itinerary. These aren't just for marine use but can be used by hikers, kayakers, backpackers, climbers, pilots, river rafters and hunters as well as boaters. A PLB is great insurance while exploring away from the mothership in your dinghy, and is a less-bulky EPIRB alternative for any small boat. As so patently brought home to our chums, the EPIRB is used to alert search and rescue services in the event of an emergency. It does this by transmitting a coded message on the 406MHz distress frequency, which is relayed via satellite and earth stations to the nearest rescue coordination centre. 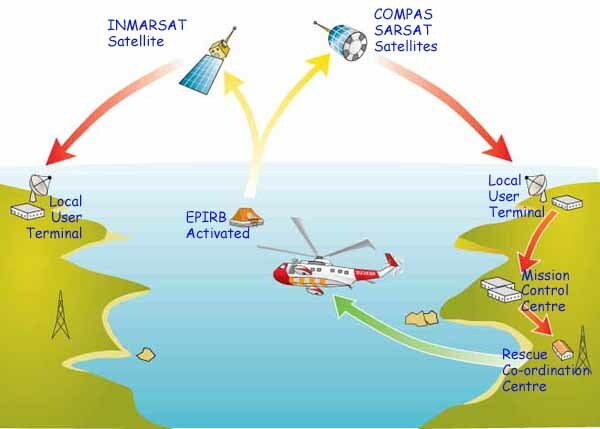 Marine EPIRBs work with the COSPAS-SARSAT polar orbiting satellite network which provides true global coverage, and can determine the casualty's position by triangulation to within 3Nm - or just a few metres if fitted with a built-in GPS (Global Positioning System). Most units also have a secondary distress transmitter, which operates on the old 121.5MHz and is used for homing purposes. any additional information that may be useful to Search & Rescue agencies. Whether or not the beacon contains a 121.5MHz "homer". Marine EPIRBS are radio transmitters, and as such must be included on your radio license.